The spring sports season is in full swing. Click to see the schedule and come out to see our teams compete. 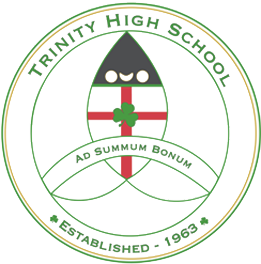 Trinity is currently accepting applications for the 2019-2020 school year. Schedule a tour, shadow a student, or register today for a Trinity education. Selections are ongoing for our House leadership positions for the 2019-2020 school year! Trinity High School is a Catholic co-educational high school located on the West Shore of Harrisburg. We currently enroll 520 young men and women in a challenging academic program. Join us at 7:00 p.m. in room 114 for our meeting. All are welcome! Freshmen and Sophomores dismiss at 11:45 p.m. Juniors and Seniors do not report to school. Freshmen and Sophomores dismiss at 11:45 p.m.
Juniors and Seniors do not report to school. the future of our 500 students.